The Garden Hills Pool is a City of Atlanta public facility located at 335 Pinetree Drive NE, Atlanta, GA 30305 in the heart of Buckhead. Please respect our neighbors and do not block mailboxes or driveways while honoring the NO PARKING zones indicated in red. 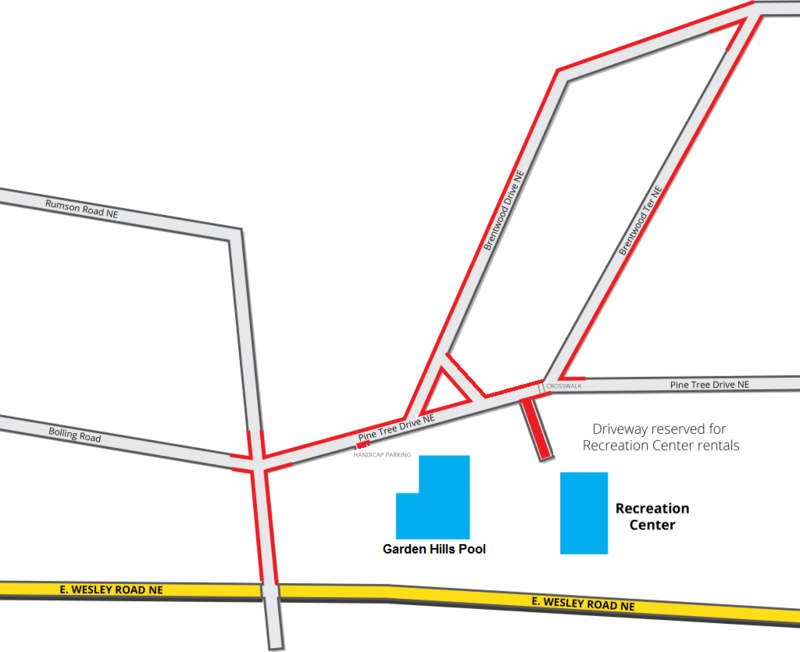 During Special Events such as Cool Sharks Swim Meets, the Second Ponce de Leon Baptist Church has agreed to allow parking in their lot located at the corner of E. Wesley Road & W. Bolling Road, just under 0.4 miles West of the Garden Hills Pool. Sign up for our newsletter, SPLASH!, to receive updates on buses that will shuttle patrons between this parking lot and the Garden Hills Pool.